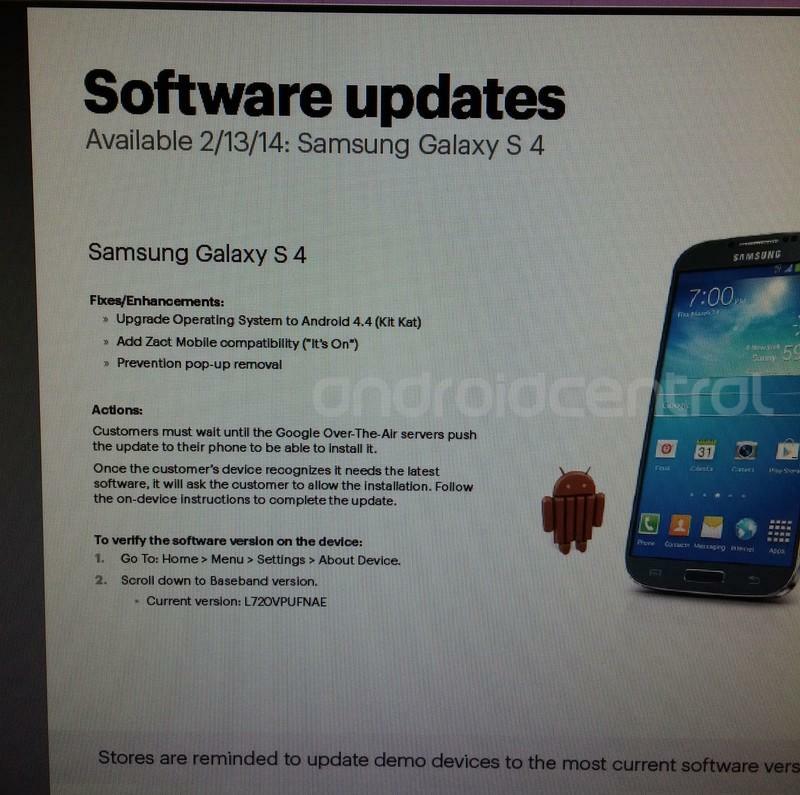 AndroidCentral has dug up a leaked document from within Sprint that suggests the Samsung Galaxy S4 might be getting an over-the-air (OTA) update to Android KitKat 4.4 today. Android 4.4, KitKat: Android 4.4.2, KitKat, is the latest release of the Android platform. KitKat includes enhancements such as restyled status and navigation bars, a new full-screen mode, color emoji support, improved closed captioning support, stronger security, smarter power use, and more tools and capabilities for better app development. Camera – Focus and exposure: Enhanced the "touch to focus" option with a new circular, on screen control that can be dragged by your finger around the viewfinder to adjust a photo's focus and exposure. Printing documents and pictures: Added support for printing photos, Google Docs, GMail messages, and other content via Wi-Fi, Bluetooth and hosted services like Google Cloud Print and HP ePrinters. Accessory: support Added support for Square credit card reader. TouchWiz improvements: a new traditional Android-style icon pack coupled with a slightly re-designed lockscreen. Sprint Support: MVNO Zact Mobile users will now be able to use the service. A similar update for the Galaxy Note 3 is expected to arrive over the course of the next several weeks.